The Water Source Geothermal project at the International Airport in Nashville, Tennessee is the recent recipient of the Institute for Sustainable Infrastructure (ISI) Envision Silver award. In 2010, the Metro Nashville Airport Authority (MNAA) was selected as one of only ten airports in the United States to take part in the Federal Aviation Administration’s (FAA) Sustainable Master Plan Pilot Program. The FAA chose the MNAA program due to its demonstrated leadership in implementing sustainability initiatives, and promotion of water conservation, energy efficiency, social well-being, and community involvement. The airport’s Master Plan included the implementation of a water source geothermal project to meet the airport’s cooling and irrigation needs. The plan was broadly supported and approved by the Board of Commissioners, a diverse group, with three representatives from the business and finance community, two pilots, two neighborhood representatives, one engineer, one lawyer, and the Nashville Mayor. Companies involved with this project include Garver, Blakley Construction Services, and Energy Systems Group—all of whom worked in close collaboration with MNAA to deliver this sustainable infrastructure initiative. Resource Allocation: The quarry lake, once considered a liability for the Airport Authority, was turned into a unique opportunity, and reconceived as a beneficial resource. Using lake plates to target a depth in the water that remains 50 degrees Fahrenheit year-round, the Airport Authority is able to generate chilled water for the cooling system. More than $430,000 in electricity costs per year are expected to be saved because of implementing the geothermal system. This represents a more than 50% improvement over the baseline that was established for this project. In addition to significantly reducing electrical demand, this project also reduces potable water consumption—by more than 30 million gallons. Prior to the implementation of this project, the Airport’s irrigation and cooling systems relied on water from Metro Water Services, which pulls water from the Cumberland River for treatment and distribution. 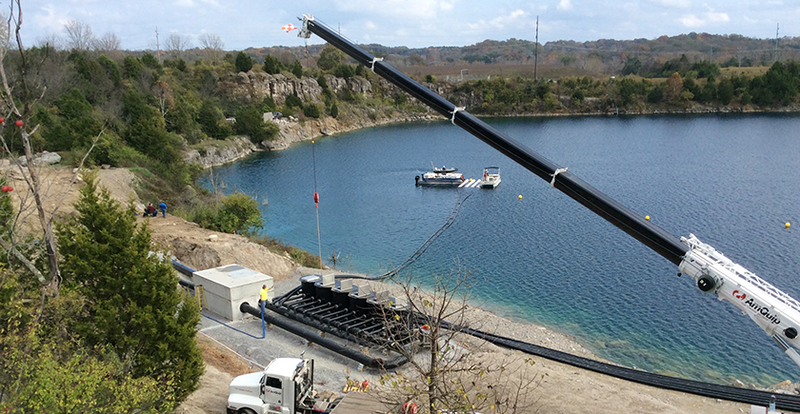 By contrast, the Water Source Geothermal System is a closed loop system that is able to meet the cooling requirements of the airport’s terminal building by relying on the quarry lake’s ability to chill water via lake plate heat exchangers. Through this system more than 21.1 million gallons of potable water used in the airport’s cooling towers are saved. Additionally, by harvesting rainwater which collects in the quarry and pumping that to the irrigation system more than 13.1 million gallons of potable water used for irrigation is saved. Both efforts significantly reduce the strain on the municipal water supply. Leadership: The Metro Nashville Airport Authority recognizes that the travelling public demands an excellent environment from which to travel through. Being the community’s “front door” for more than 12 million people travelling through the airport each year, MNAA sees this as a valuable opportunity to promote sustainability and the community more broadly and has implemented several educational programs aimed at travelers, with plans to roll out a Green Screen in the terminal building to continue educating travelers regarding the sustainability measures put in place. The project team overcame significant challenges to securing funding for this project. The policies set forth by the Federal Aviation Administration and the Tennessee Department of Transportation do not typically provide funding for this type of project; funding is typically reserved for projects such as runways, taxiways, parking decks, and hangars. To overcome these funding barriers, the project team targeted energy efficiency project funds that were set aside in the FAA’s 2012 Reauthorization Act. The project team worked with the FAA’s headquarters in Washington, D.C. to navigate this regulatory approval process. This successful grant acquisition, as well as the energy performance contracting for this project, has opened the door for more energy efficiency projects to be implemented at other airports across the country and demonstrates significant leadership in sustainability. Climate and Risk: The Water Source Geothermal project will significantly reduce the airport’s dependency on its natural-gas fired boilers, which use on average 39,700 therms of natural gas per month. Emissions associated with the use of these boilers is significant, but the Water Source Geothermal project will reduce emissions of carbon monoxide, nitrogen oxide, particulate matter of both 10 and 2.5 micrometers or less in diameter, sulfur dioxide, and volatile organic compounds—all of which contribute to poor air quality.